Cask ale is important to each of us in very different ways. In this collaborative blogging effort Mark (beer writer), Shea (young female drinker), Glyn (bar manager), Kelly (brewer) and myself say why it's important. Some people paint pictures and draw sketches, some paint their toe nails green, some sing and dance and play the guitar whilst others knit jumpers and stitch clothes. Creativity is a characteristic we share; there within all of us it lies, for some more eager to show itself than for others, it lies and it waits. From global hit record to origami swan, that creativity must find an outlet; for me it found that outlet in home brewing. Irrespective of image and perception, the fact is that an immeasurable number of ingredient and process combinations mean a myriad of possible flavours and aromas. Far from being boring, brown and bitter; cask ale is a living, evolving product for the true connoisseur. Hop varieties in their hundreds become the colour palette of the brewer, hewn over a canvas of malt to produce anything from a deeply rich and robust coffee stout to a zingy, light, citrus-packed golden ale. 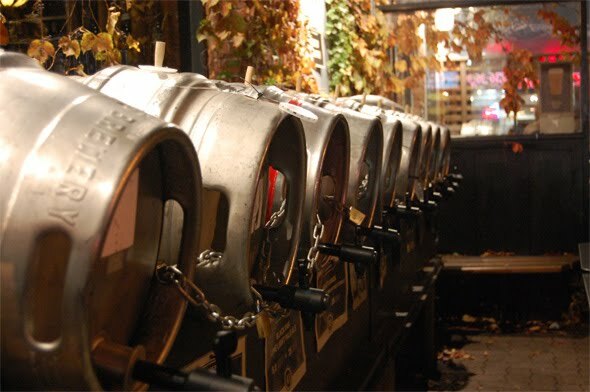 Good cask ale is carved out of the best raw ingredients through the application of knowledge, skill and creativity. For the drinker it provides a spectrum of flavour more than comparable with wine; there’s a beer for hot summer evenings, cold winter nights, to accompany your favourite food or for a special occasion. It’s a drink that offers new depth and complexity as appreciation grows, it’s a drink that changes with the seasons and that matures with time. Beer is a drink devoid of pomp and arrogance, it knows no sense of material worth, the most expensive world class beer costing a fraction of the equivalent wine. Beer is here for drinking, nothing more, nothing less. As a home brewer, beer provides me with a platform on which I can unleash my imagination. With access to raw materials of the same quality as the professional, I can conjure up any flavour combination I like, burning up every last joule of that eager creative energy. The enjoyment and pleasure I get from a pint of good beer now extends beyond merely drinking it. Gillian Orr asserts that “your tipple of choice can say a lot about you”. Well let that be the case. Let cask ale define me as a person that puts flavour on a pedestal, concerned with what’s in the glass, not what’s around it. In Britain we’re experiencing a brewing renaissance; when I go to the pub, I know what’ll be in my glass. Cask ale is as likely to be brown and boring as it is to be pale and exhilarating. Cask is a form of dispense, not a style of beer. I'd rather drink interesting keg or bottled beer than indifferent cask. I agree entirely. Beer can be brown and boring regardless of dispense. The focus in this piece is on cask beer as it was written as a reaction to the Gillian Orr article. That's the only reason. We had originally planned to post these blogs straight after Orr's article was printed, but things got delayed. I can see now that it has sort of lost some context with the passing of time. Hopefully it doesn't distract too much, to be honest you can take "cask ale" to mean "beer" throughout my post. "your tipple of choice can say a lot about you"
does it?. Maybe, for some. Some people do make judgements on the basis of clothes, car, accent, manners & I presume choice of drink. Funny old world. "I'd rather drink interesting keg or bottled beer than indifferent cask". Well, wouldn't everyone? I'd guess that the collaborative that has written these peons of praise would. You could say equally "I'd rather drink interesting cask beer than indifferent keg or bottled beer". It has to be admitted though that fact that cask beer is live is both its triumph and its disaster as although good handling will raise it to the heights, bad handling will cause it to plumb the depths. But keg beer, even new style keg beer isn't always at its best either and is certainly no guarantee of anything. Now having had more duff pints of cask that the collective has had pints of cask, I still know when done well for the right style and strength, it is unbeatable. It is why I keep coming back for more. They think that too, so good for them. Love the way you talk about creativity Mark, and in the main it's very much a part of 'cask ale'. But surely it's also a characteristic of making good beer, or any good, quality product for that matter. Mark: Yeah, I agree. "Good cask beer" and "Good beer" are pretty interchangeable in my post to be honest. The points I make are applicable to both (with the exception being the line about a live product - and even that applies to bottle conditioned beer). I agree that creativity will likely be a characteristic of all good beer, regardless of dispense. Tandleman: I don’t think anyone is disagreeing with you about the merits of cask conditioning. The point that Zak seems to make is purely around it being one style of dispense, not the be all and end all. I like the collaboration on this peice, Chunk. As for the point; I know where you are coming from. For me Zak's initial short comment sums up how I feel in a succinct blast perfectly. However - nice post, glad you've put it up and out there. ome people paint pictures and draw sketches, some paint their toe nails green, some sing and dance and play the guitar whilst others knit jumpers and stitch clothes. Creativity is a characteristic we share; there within all of us it lies, for some more eager to show itself than for others, it lies and it waits.